Last month, Jones Natural Chews exhibited in Orlando at Global Pet Expo – one of the largest trade shows in the pet industry. 2019 marked the 14th year Jones Natural Chews attended this event, but this was still a year of firsts including a larger island booth, hanging sign and new product announcements (keep reading to find out what they were!). There was something for everyone at this jam-packed three-day event – from workshops, networking opportunities, and a new product showcase, to exhibitors promoting dog beds, the latest fashion accessories and, of course, toys, food and treats. 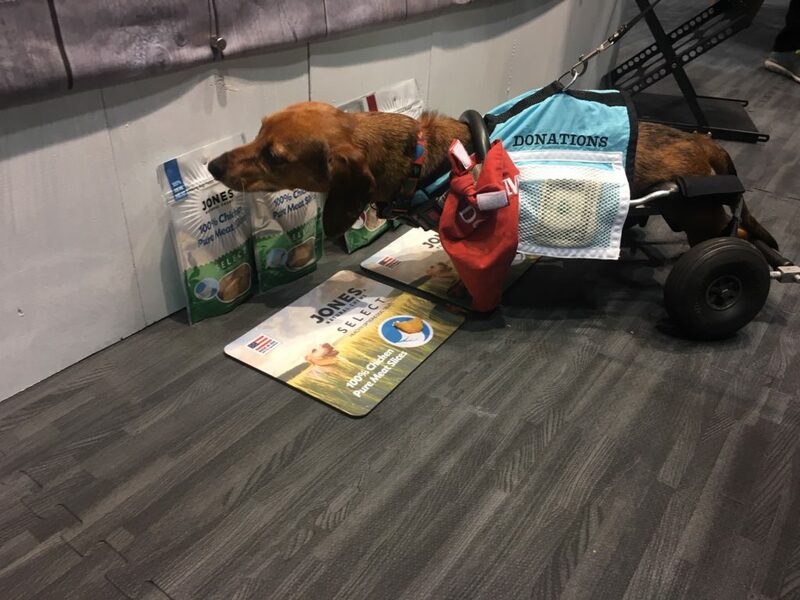 With pet products spanning 16 football fields inside the convention center, there was no shortage of companies vying for space in the chews and treats segment and the attention of thousands of buyers. However, there are several important factors that retailers consider when choosing which products to stock on their shelves and promote to customers. This factor is not new, but choosing American-made products continues to be a top priority when it comes to dog food and treats. But, beyond just selecting products that are manufactured from a reputable company in the USA, it’s also critical that retailers and consumers know the origin of the meat used in their treats and the other safety standards in place at the facilities where they are made. 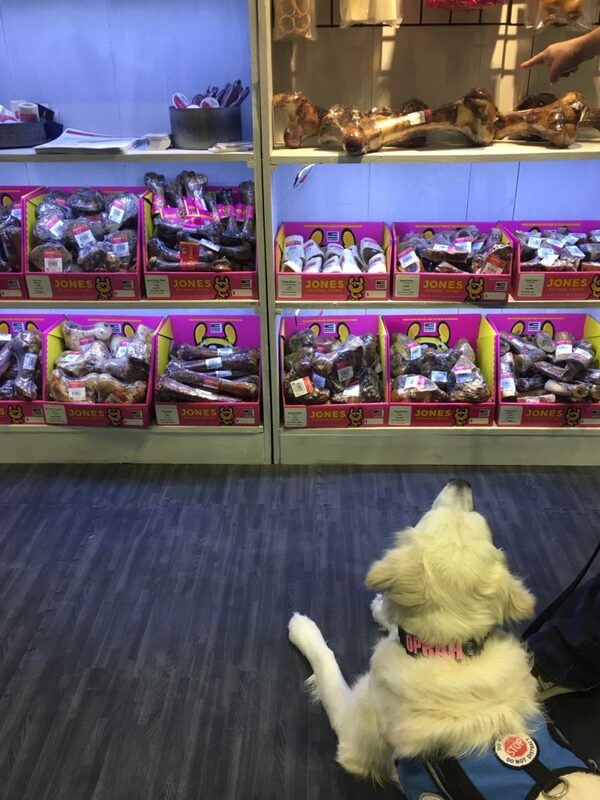 Oprah from Little Angels Service Dogs looks at the variety of treats and chews in the booth. At Jones Natural Chews, all products are 100% raised, sourced AND made in the USA. Just as important, Jones goes above and beyond in their effort to make sure they are providing safe and wholesome chews and treats. They adhere to a strict Hazard Analysis Critical Control Point (HACCP) plan which includes stringent guidelines for cleanliness, product testing (including testing by 3rd party laboratories), lot code tracking and other evaluation requirements. Furthermore, Jones is SQF certified – a Safe Quality Food program recognized as the food sector industry standard for safety and quality control requirements. All of these measures are in place to ensure the products are of the highest quality and best flavor. This term has received a lot of attention recently as the definition of what natural really means is closely examined with regard to food sources. With so many companies using this term to describe their products, how do consumers know that they are really getting a quality product, and what makes it “natural”? Jones Natural Chews uses the definition of natural as established by the Association of American Feed Control Officials (AAFCO): a feed or feed ingredient derived solely from plant, animal or mined sources, either in its unprocessed state or having been subject to physical processing, heat processing, rendering, purification, extraction, hydrolysis, enzymolysis or fermentation, but not having been produced by or subject to a chemically synthetic process and not containing any additives or processing aids that are chemically synthetic except in amounts as might occur in good manufacturing practices. Perhaps the easier definition is what is NOT considered natural – ingredients that are chemically synthesized, such as vitamin and mineral ingredients, preservatives and special-purpose food additives, flavors and colors. On the Jones Natural Chews website, there is a list of ingredients and definitions available for consumers to learn more about what goes into their products. The third factor of high importance to retailers at Global Pet Expo is innovation. This factor was evident at the new product showcase which featured more than 3,000 product launches, and at almost every booth where the latest gadgets, new products, and improved selections were on display. With more than 100 products in 300+ SKUs available for distributors and wholesalers to choose from, Jones Natural Chews continues to lead the segment in innovation. The extensive variety of treats and chews in all different sizes and packaging options offers a solution for every buyer. This year at the show, three new flavors were announced to complement some of Jones’ most popular items: Pork Blend Links, Turkey Woofers and Peanut Butter Flavor Stuffed Bones. Kira from LoveyLoaves Sanctuary sniffs the new single-ingredient treats. Also new this year, the Jones Select line of super-premium, healthy treat options announced new single-ingredient Pure Meat Slices in 100% Chicken and 100% Turkey flavors. These natural, high-protein snacks join the line of limited ingredient options which includes organic and exotic proteins, nutritional blends and training treats. By offering additional proteins and flavor options, dogs with allergies, diet restrictions or finicky pallets are sure to find something they enjoy, which translates into happy consumers and repeat business in retail stores. American-made, natural and innovative products were among the top factors for buyers at this year’s Global Pet Expo trade show, and they are likely to continue to be important to retailers and consumers for many years into the future. Jones Natural Chews understands the value of manufacturing high quality, reputable, safe treats and chews which is why these factors have been part of The Jones Difference for more than 30 years.